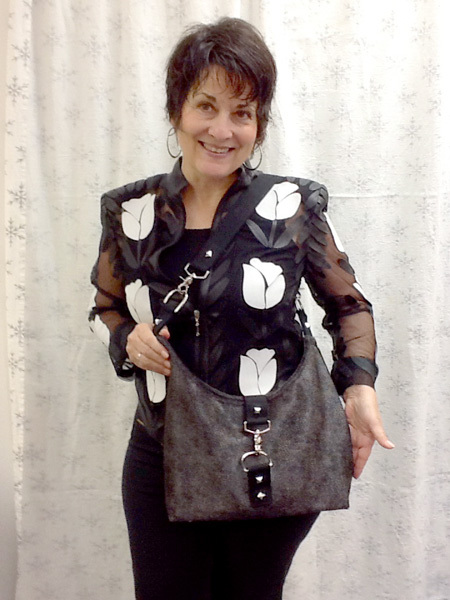 Many of Jane's sewing students met for a potluck and to share the garments and accessories they made for Jane's leather/ faux leather challenge. It was a festive occasion and SO great to see everyone. Some amazing pieces were shared. Students made leather jackets or coats, faux leather coats, skirts, and purses. Some of them used leather as trim.. All of them were wonderful. Below are a few examples of the completed projects, and more will follow. So be sure to watch as more photos will be added as the garments are completed. 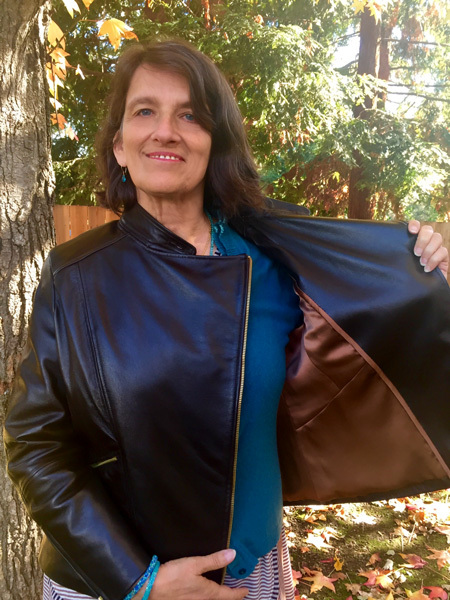 Vicki completed her amazing leather jacket. 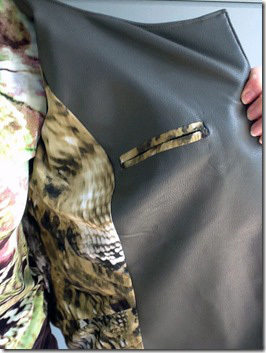 The rich brown leather came from The Hide House in Napa, and she used a Marfy Italian pattern. 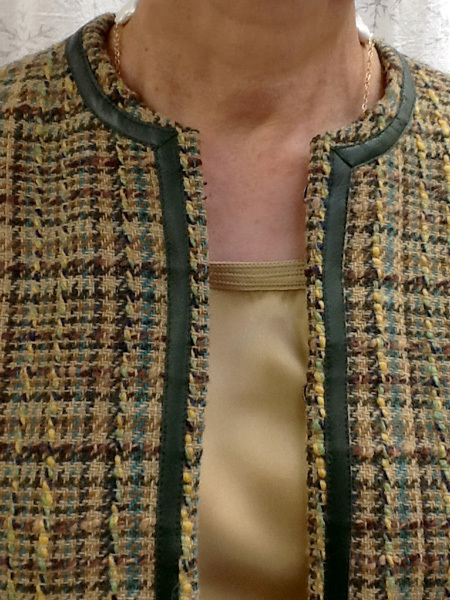 There many couture techniques with the making of this jacket. It is an amazingly beautiful jacket. 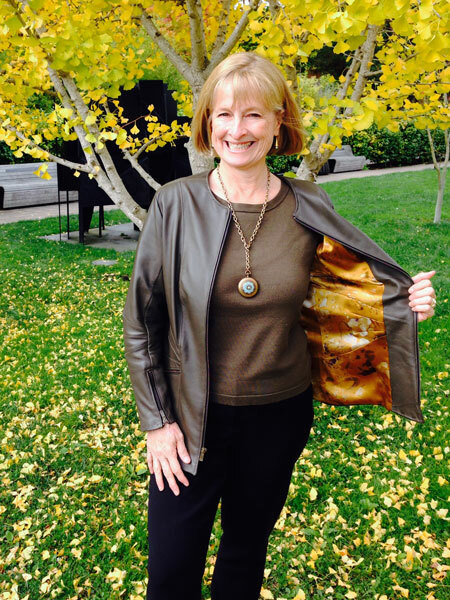 The Moto jacket is lined in a delicious silk charmeuse. 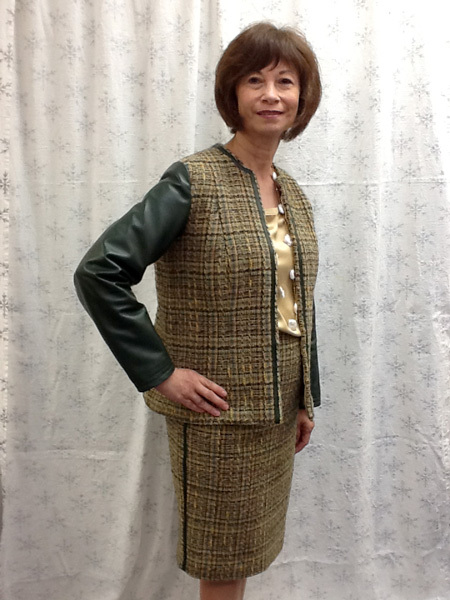 Patty made a wool jacket in the Chanel style. She lined it with silk charmeuse and used leather on the sleeves and trim. 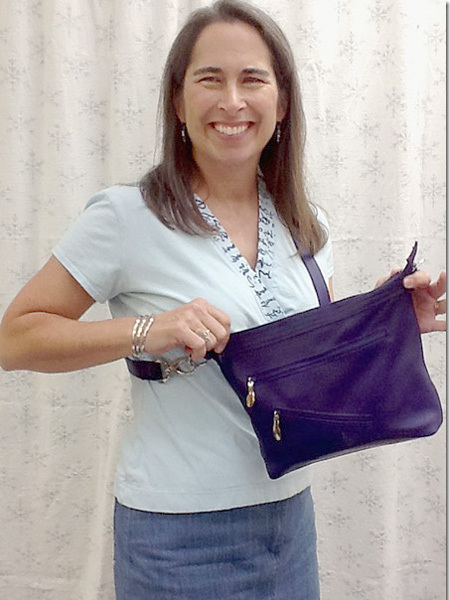 Sally made a custom, purple, leather purse. Her hardware from Etsy. 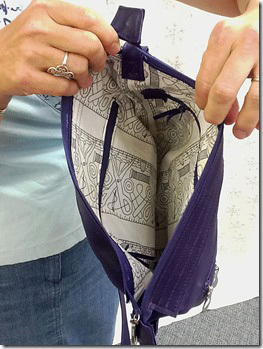 She put several pockets on the inside as well as the outside. 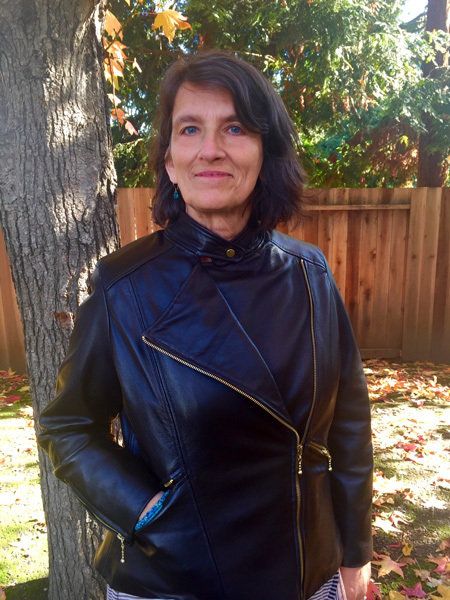 Lark made a lined moto jacket using faux leather. The fabric came from Gulf Fabrics, and is called Brisa which is described as a luxurious simulated leather engineered for breathability. The company claims it is durable and very supple. She added a great pocket on the inside. Jackie used a Craftsy pattern and some of their instructions. She found the leather online. 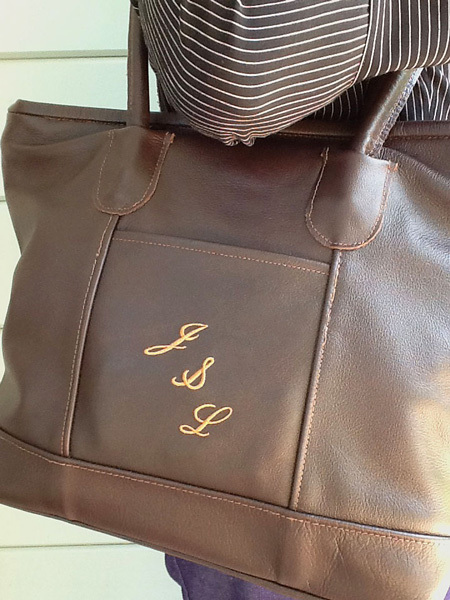 Jackie embroidered her initials on this beautiful bag. 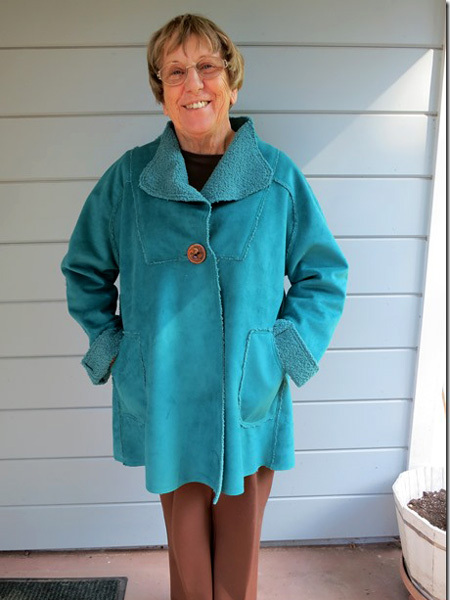 Betty made this wonderful coat using a faux shearling with a sueded side. 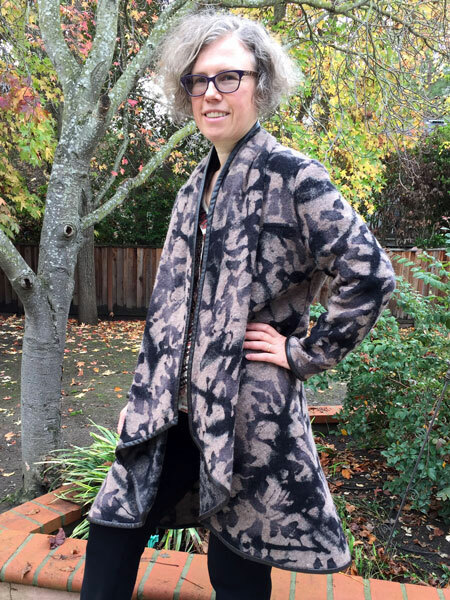 The coat looked wonderful on everyone who tried it on. 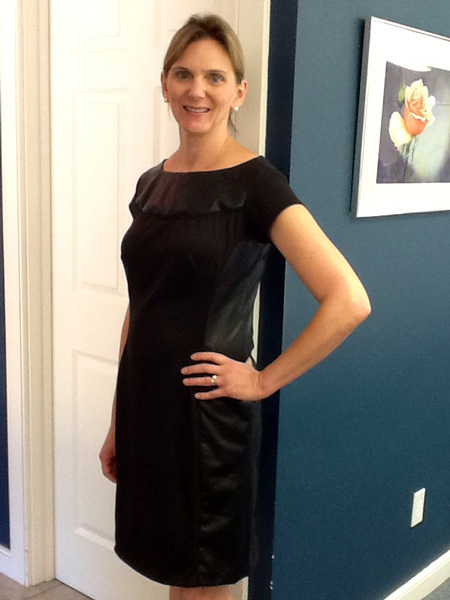 Katherine purchased faux leather and a black knit fabric from Stone Mountain and Daughter Fabrics, and she made this dress for Jane's leather challenge. She used the leather for the side panels and the front yoke. 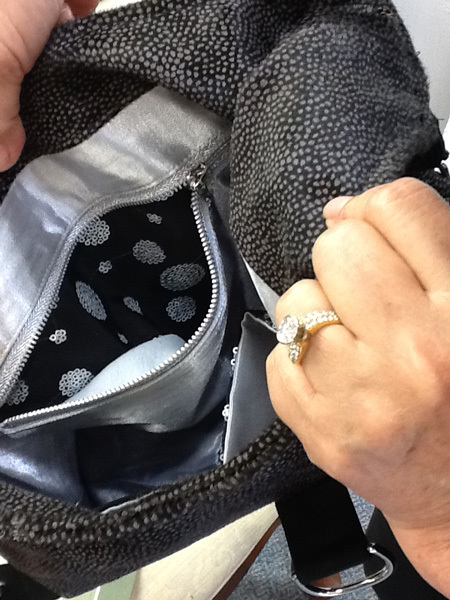 The inside of Santina's bag. Kathryn bought some leather in Morocco and some from The Hide House in Napa. 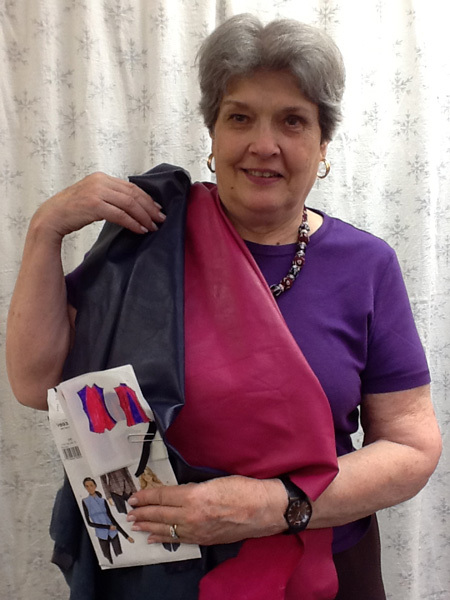 She plans to make a color blocked vest with Vogue pattern V8932. 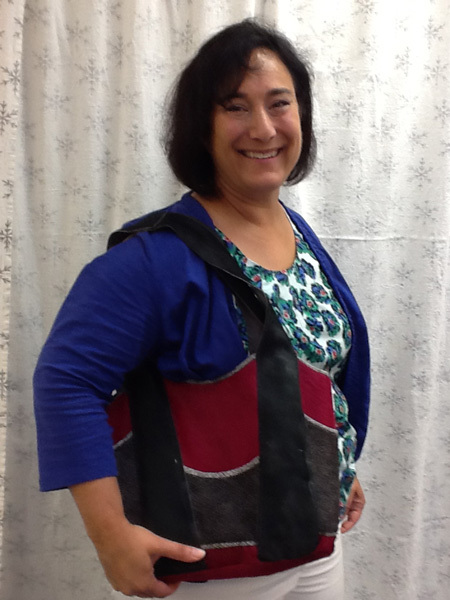 Here is her completed vest. Great job. 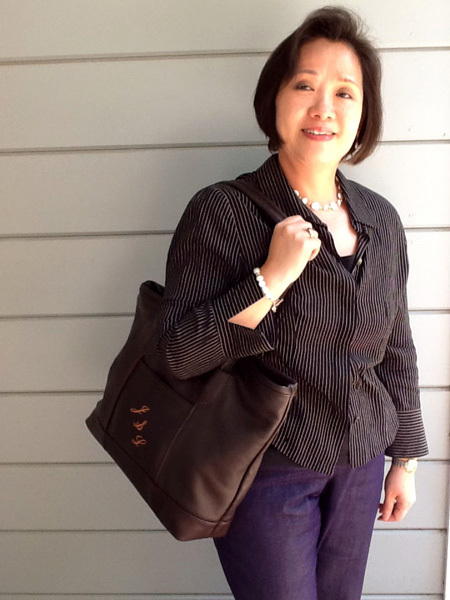 Joy's leather project was a colorful bag. It has three different types of leather which she bought from The Hide House in a Napa, CA while on a field trip with Jane and her students. 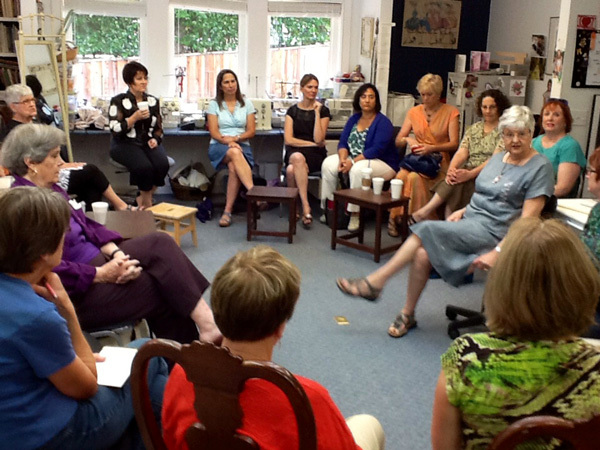 Sandra lives in New Jersey, and has joined Jane on her sewing retreat to Asilomar. 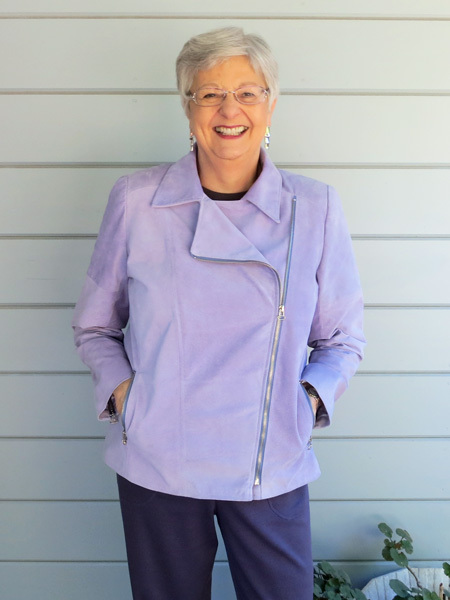 She made this ultrasuede jacket using Marcy Tilton's Vogue pattern 8982. 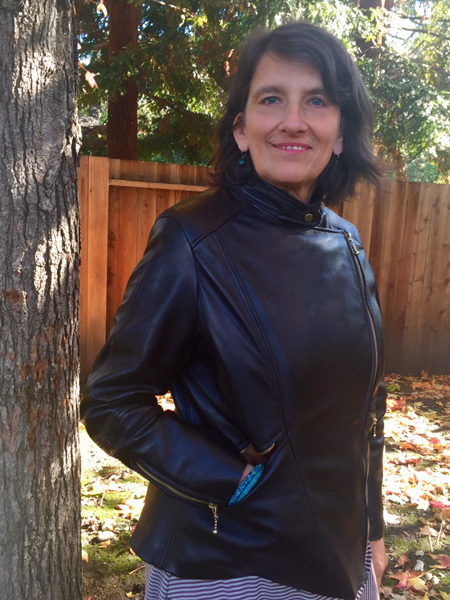 Janice selected her teal colored leather from The Hide Housein Napa, CA. 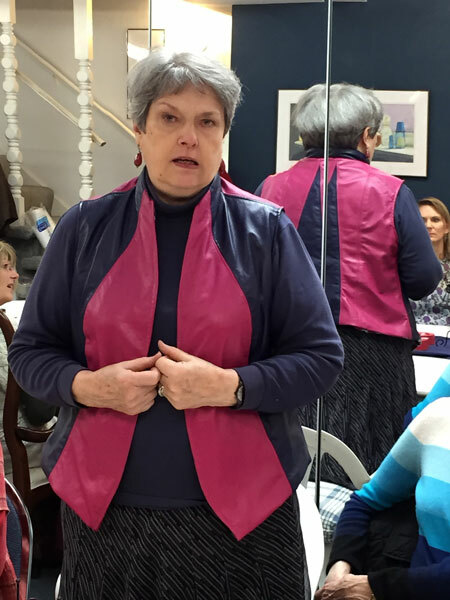 She lined her jacket with a rayon print and underlined with cotton flannel for warmth. 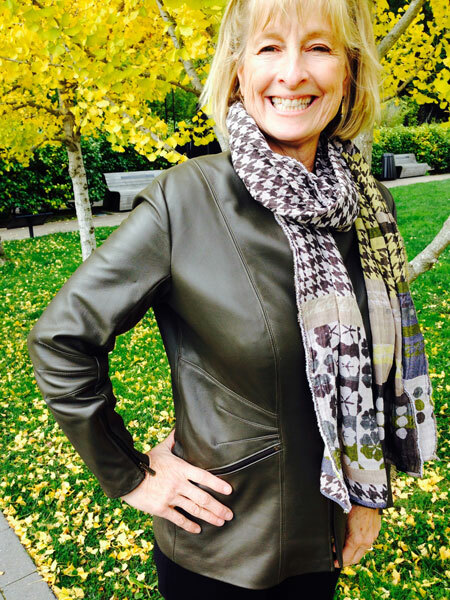 Jane selected Style Arc's "Ziggi" pattern for her lavendar leather jacket. 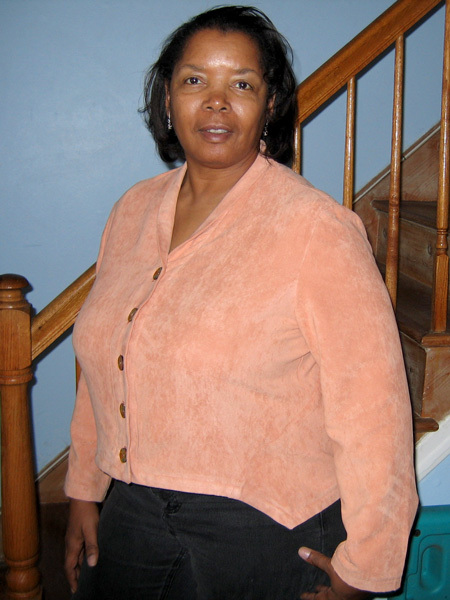 She is also wearing coordinating slacks made in a ponte knit from Stone Mountain and Daughter Fabrics. 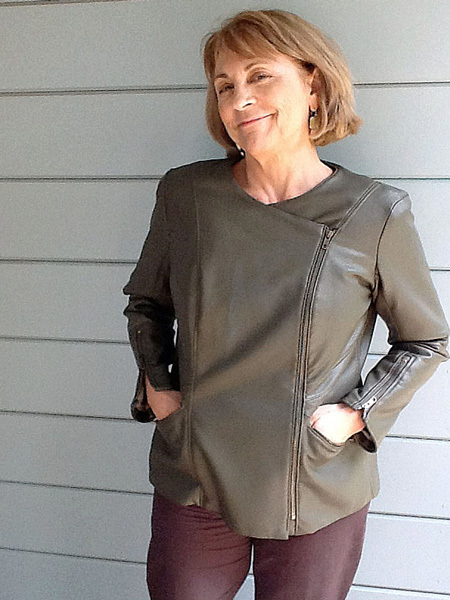 Maria made this wonderful leather jacket using Marfy pattern 2270. She used a fabulous silk lining. She has more of the leather to make another garment.